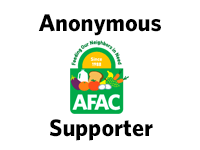 AFAC distributes groceries to over 2,300 families every week. More than 35% of the people we serve are children. Help AFAC collect heart-healthy non-perishable foods. Items like low-sodium soups, vegetables, and proteins (tuna, salmon, chicken, beans) will keep our families and senior clients eating warm meals throughout the winter months!